This post will take the reader through a front engine tear down of a 2.2L Toyota Camry with the 5S-FE engine featured from 1997 to 2001. 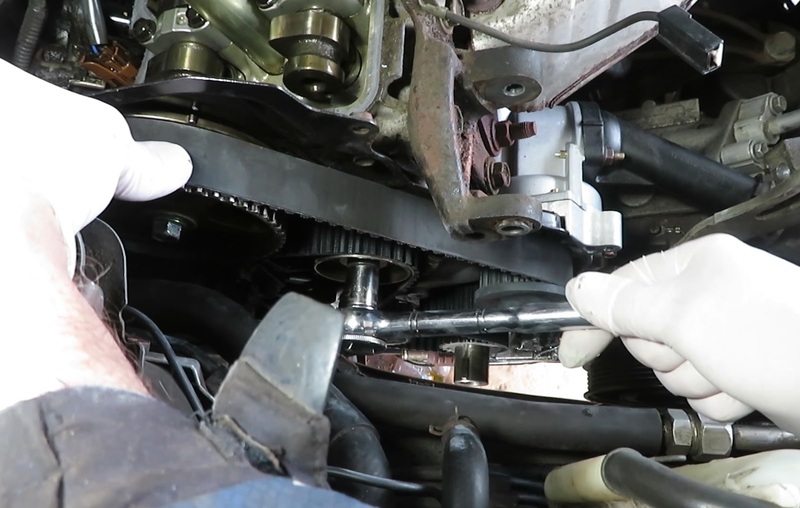 The timing belt will then be removed and a new belt installed, with careful attention given to the timing positions of the the camshaft and crankshaft. Other jobs possible now with the engine apart are the front oil seals and the water pump replacement. 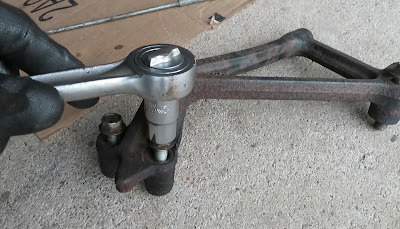 Tools: Floor or other jack, jack stands, 1/4", 3/8" and 1/2" drive metric sockets 10, 12, 14 and 19mm, wratches and wrenches, large breaker bar, harmonic balancer remover or other puller, two 6mm x 70mm thread pitch 1.00 bolts. 1) Disconnect the battery negative. 2) Loosen the right front wheel lug nuts, jack up the front and remove the wheel. Set down on stands or blocks. I like wood blocks. 4) Remove the larger drive belt. 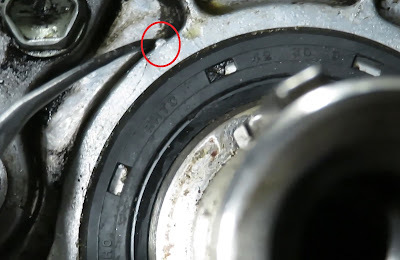 Loosen the 14mm alternator pivot bolt and the 12mm alternator adjustment lock bolt. Then turn the 14mm adjustment bolt clockwise until the belt loosens enough to remove. Loosen the bolts indicated by the white arrows. Turn orange to remove belt. 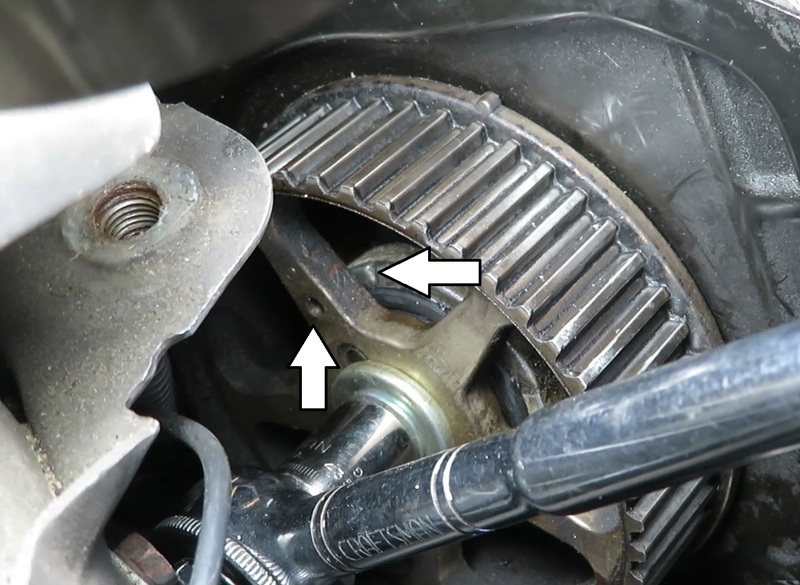 5) Remove or set aside the alternator. This is optional, but recommended since it is quite easy and affords more room to work. Remove the two aforementioned bolts, unplug the wiring and unbolt the 10 mm battery plus connection. If desired it can be set aside, out of the way with wiring attached. 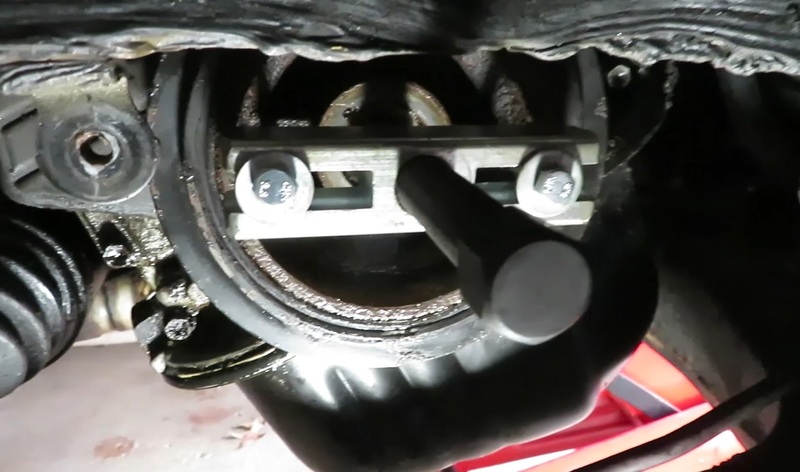 6) Remove the front engine mount, sometimes called the "dogbone." Unbolt three 14mm mounting bolts and jiggle it out. 7) Unplug a chassis ground. Remove these three bolts and unplug the ground wire. 9) Remove the power steering belt. The difficulty is in loosening a 10 mm pivot bolt above the pump. I got in there with small tools, a 1/4" socket and ratchet with a small cheater pipe. Now the easier lower 10mm bolt, accessible with 3/8" ratchet, socket and 6 inch extension bar. Now move the pump forward to loosen and remove the belt. 10) Remove the upper timing cover. There are four 10 mm bolts of three different lengths used here. the lower one is a challenge. The upper firewall side bolt is very long and owing to it's great length and a small arc of tool rotation, quickly becomes tedious to remove. 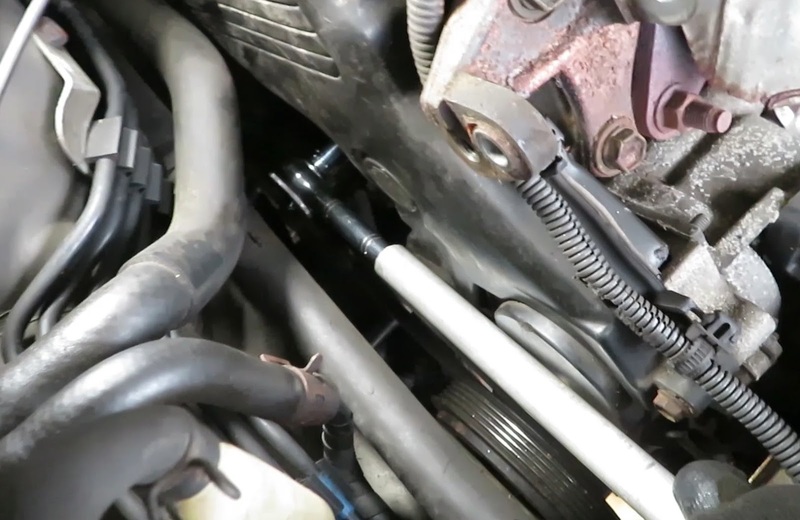 The other long bolt is also on top and the length is needed as it serves double duty as a wiring harness holder. With all four removed, jiggle the cover, with a very tight clearance up and out. 11) Place the engine in the top dead center timing position. This is best done by turning the crankshaft with a socket and breaker bar. See the timing section below for detail on this position. 12) Remove the crank pulley bolt. This 19mm bolt will likely be a challenge if you don't have air tools. I normally use a home-made fixture for this job, made out of 1/4" angle iron. It didn't work on this application. Instead, I was forced to use the "starter bump" method, and I was pleased with the results. Take precautions to disable the ignition (starting the car is a very bad thing in this situation). I found pulling the spark plug wires the easiest way. Wire up a large breaker bar at a right angle to a substantial part. I used the lower control arm. Then give the starter a few taps. No One can be anywhere near that side of the car during this procedure! 13) Remove the harmonic balancer. Likely you will need to use a puller as I did. If so you will need two bolts, 6mm x 70mm with a thread pitch of 1.00. 14) Remove the lower timing cover. This is easy with 4 accessible 10mm bolts to remove. Some wiring will need to be unclasped before the cover is removed. 15) Remove a small thin cup washer. 16) Loosen the tension pulley, move it downward, hold it there with a pry bar and tighten in that lowered position. 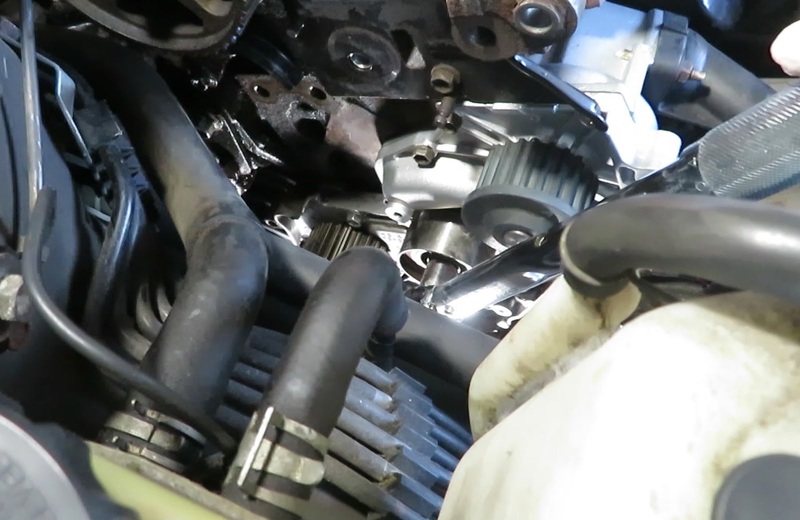 17) Slip off the timing belt. 1) Set camshaft timing. 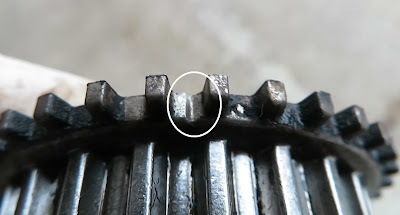 The hole in the cam sprocket will align with a tick mark on the bearing cap behind it. It may help to check this by putting a small tool through the hole and feeling for the recessed tick mark. 2) Set up the crankshaft timing. These marks are very small, so here are some pictures to help find them. 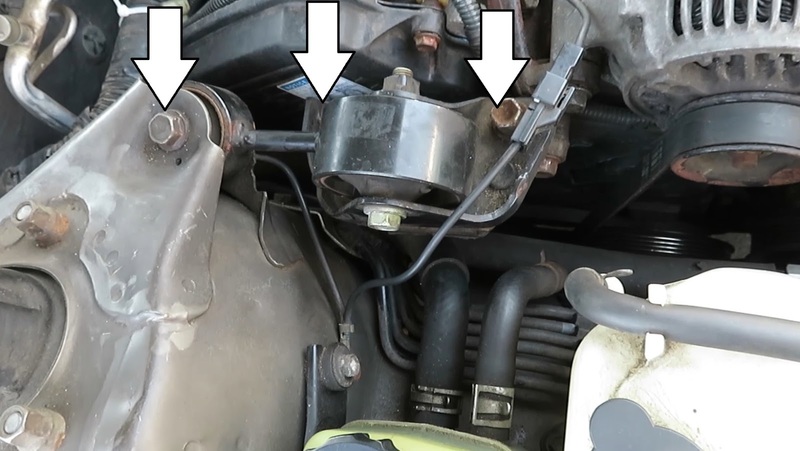 1) Install the idler pulley if removed or replaced. Torque to 31 ft lbs. 2) Install the tension pulley if removed or replaced. Do not torque at this time. Temporarily tighten it in the downward position as necessary to install the belt. 3) Install the belt. Start at the radiator side, keeping that side of the belt taut (slack free). Thread it through the other side and when fully positioned, release tension on the tension pulley only enough to take up the slack in the belt. Do not torque the belt at this time. This comes later. 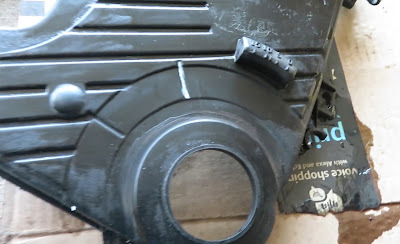 4) Install the belt guide washer. The bowed side faces out. 5) Install the lower timing cover. Make note of the timing mark on the cover- 45 degrees before top dead center. I highlighted it with white paint for easier ID. 6) Install the harmonic balancer. 7) Install crankshaft pulley bolt. It does not need to be torqued at this time. 8) Rotate the engine by hand 1 7/8 turns. At this point the mark on the harmonic balancer will align with the mark 45 degrees before top dead center on the lower timing cover. Now you can torque the tension pulley to 31 ft lbs. 9) Rotate the engine manually through two revolutions, making sure it turns freely and recheck all timing marks afterward. 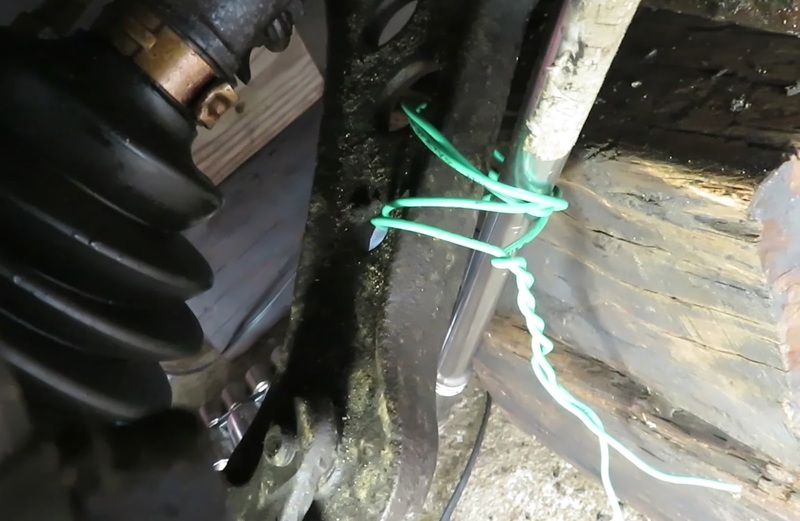 1) Lock the crank pulley down by some means and torque the pulley bolt to 80 ft lbs. 2) Install the upper timing cover. There are four 10mm bolts of three different lengths. The two upper bolts are longest and a wiring harness holder slips over the end of the threads. The lowest bolt is shorter and the most difficult and will have to be started by feel. 3) Secure the wiring harness to the end of the upper timing cover bolts. 4) Install the front engine bracket with the three 14mm bolts. I could find no torque specified for these bolts. To assure alignment, it is advisable to start the dogbone mount bolts before torquing the bracket. 5) Torque the three 14mm dog bone bolts to 47 ft lbs. 6) Install the power steering belt. 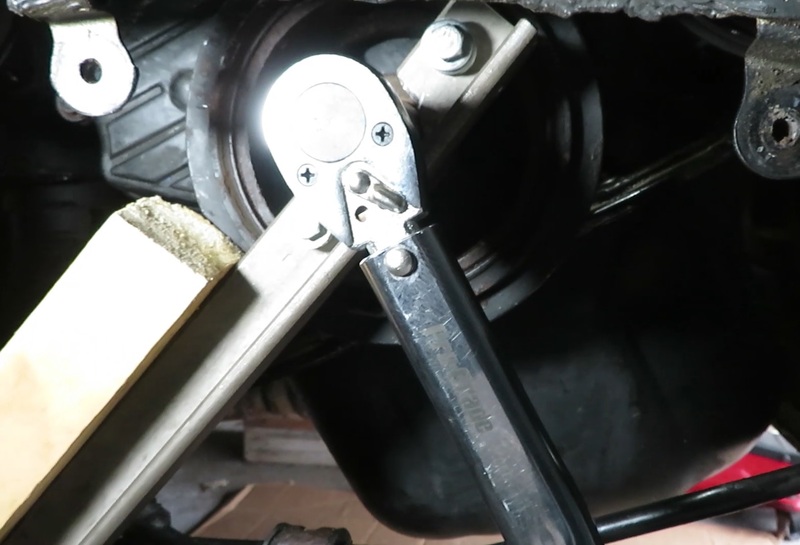 Use a pry tool to tighten the belt to proper deflection while tightening the lower 10mm mount bolt with a 3/8" ratchet with a six inch extension. 7) Tighten the upper 10mm power steering lock bolt. This one is a struggle to reach. I used a 1/4" ratchet and socket. 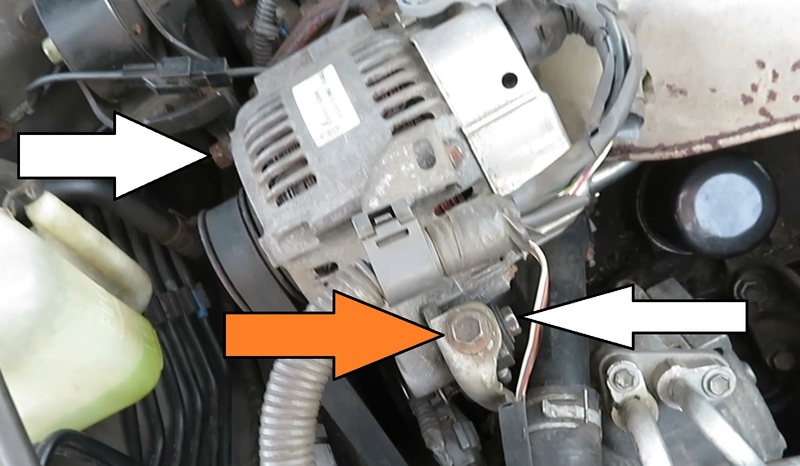 9) Wire up the alternator if it had been un-wired. 10) Install the wheel well splash cover. 11) Install the wheel, set the car down, torque the lug nuts. 12) Wire up the battery and run the engine, checking for leaks.